These are some of my favorite Mongolia pictures. These photos were taken during my travels across the Mongolia. If you see anything you like, there are links to my pages on the place names so you can read more about a particular location. Enjoy! 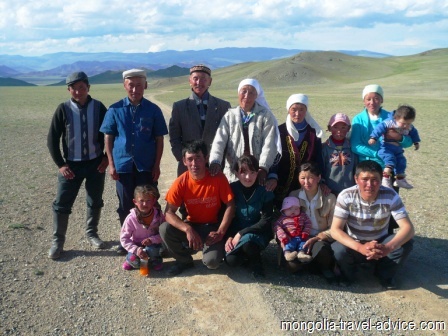 Photo of an ethnic Kazakh family in Western Mongolia. Read more about the Khazakh enclave and their special culture. 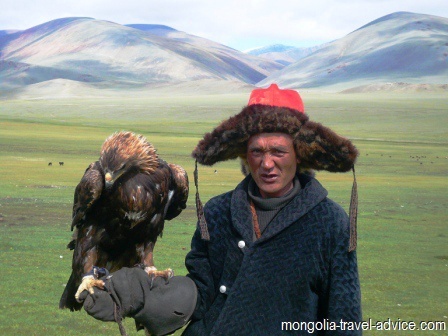 Hunting with eagles in Western Mongolia. Read about my page on eagle hunting for more information on how they catch eagles, train them, and how they catch rabbits, foxes and wolves. 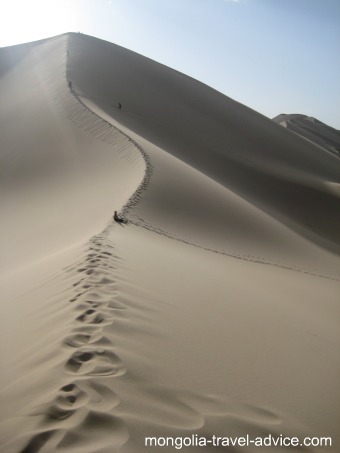 Hiking in Central Mongolia. 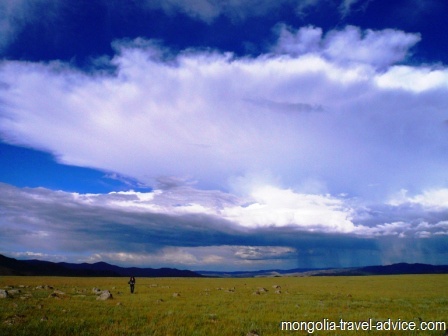 With no fences and no private property, you can hike where ever you like in Mongolia! Ceremony underway at the Naadam Festival in Ulan Bator, the capital of Mongolia. 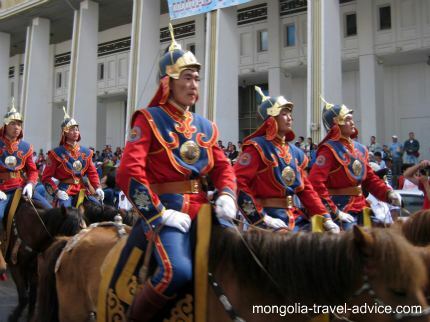 The Naadam festival happens in early July. 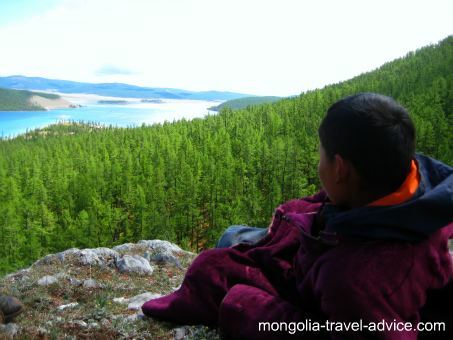 Young Mongolian boy in a Del, looking out over Lake Khovsgol, one of the most scenic destinations in Mongolia. Young kids on horseback, by the shores of Khoton Nuurin Western Mongolia. 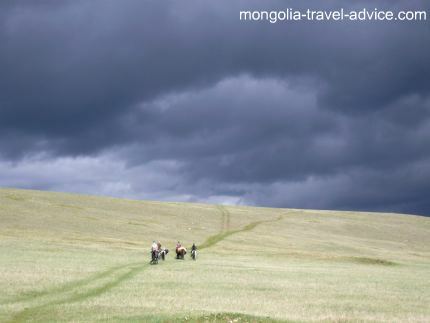 Going a horse riding in Northern Mongolia, and heading into the storm. 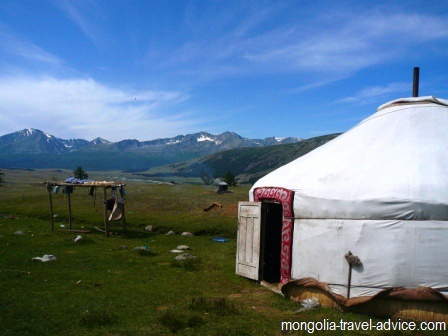 Mongolian ger, the traditional nomad dwelling. 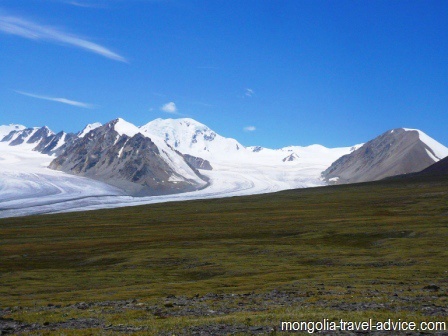 Half the population of Mongolia live in gers for at least a couple of months a year (i.e. summer), but only about 10% or so are permanent nomads. 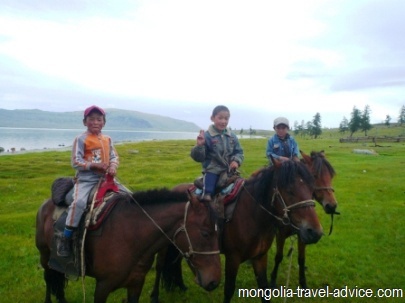 You will definitely have an opportunity to visit a ger in Mongolia, and enjoy the wonderful hospitality of the local people.